The “mark” MEET THE BLOGGERS? On the other hand I happen to think at least the moral rights to the term, and if there is a trademark that as well, do indeed reside in John along with Marty Schwimmer, seeing as how they first used it in commerce, jointly, the first two years. I always assumed it was “theirs,” and, well, I did associate the term with a single source (them, jointly — by which I mean as an unincorporated association, not “both single sources at the same time”). I assumed last year’s use was under license (and it was overseas anyway) and therefore did not in any way undermine their claim to the term. That’s why I was a little surprised to learn from John and Marty, upon an email inquiry as to whether I could join them again in sponsoring the event in Seattle this spring as I did in Chicago two years ago (um, that was me, wasn’t it? I thought so…), that it was out of their hands: Seattle homeboy and blog-meeting usurper Mike Atkins had unilaterally declared sponsorship by his firm, and that was all she wrote. Well, I guess the young, clean-cut home town favorite with the quick draw “wins” this one, huh. You know how it goes out in Washington — when it comes time to play, they play by Microsoft Rules. So, okay, drinks are on Graham & Dunn, no need to walk underground, and at least Marty and I don’t have to run up whatever the Michigan Avenue of Seattle is looking for a cash machine as we did in Chicago. You can RSVP here. Yeah, I smell acquiescence on this “infringement,” or is it just that rainy Seattle atmosphere? It’s a brutal world out there, boys, especially for descriptive would-be trademarks in the making. You should both know about that. But I’ll grant, you may well have thought you could trust trademark law bloggers, too… Live and learn. LOL! I remember you had to make the trip to the cash machine! Ah, didn’t realize the back-story behind this year’s do. The plot thickens – looks like John needs to work that trademark prosecution magic, we’ll all send in declarations. Ron: Didn’t Mike Atkins take the photo that you are displaying at your website? Anyway, I’m a little disturbed that the “Meet the Bloggers” event seems to be going “mainstream.” Perhaps its time for a rebel group to sprout up? If only I could come up with a name! PS: At the time I “coined” the “mark” MEET THE BLOGGERS, the movie “Meet the Fockers” was still kicking around. I thought “Bloggers” was a memorable play on “Fockers.” In other words, back in 2005, the phrase MEET THE BLOGGERS seemed a bit more clever than it does today. Now it just sort of lies there like a dead fish on a Seattle wharf. Did Mike take that picture? I don’t know — I just saw it, liked it, and took it for myself! Meet the… there was a move called that? Really? Whatever the trademark issues, I’m looking forward to meeting you all! 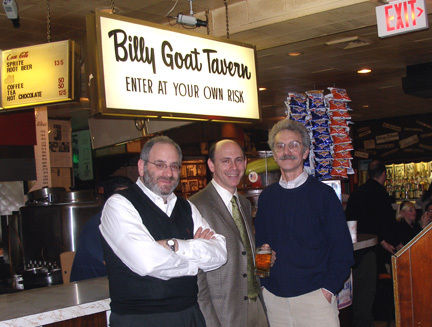 While the Billy Goat Tavern was a fantastic choice of venue, I kinda like the idea of free drinks!